Carol sits down for a Q&A with HR Magazine's Book Blog about identifying high performers. Read Carol's conversation with SHRM Online about the interviewing process. Carol's #Nextchat describes motivation-based interviewing. The candidate seemed to have it all—a great resume, the perfect skills and confident responses to all of your interview questions. You had a good feeling about this one. Finally, a high performer—that terrific hire who undoubtedly would produce extraordinary results. But that’s not how it turned out, was it? Here’s a little secret: Before you can hire a high performer, you have to correctly identify a high performer. And to identify a high performer you have to ask effective interview questions…and know how to evaluate the answers. Hiring the best requires more than just assessing a candidate’s skill. Interviewers must also determine the candidate’s attitude toward overcoming obstacles and how passionate they are about achieving your goals—both proven predictors of future success. Hiring expert and popular keynote speaker Carol Quinn provides a complete guide for accurately and reliably assessing skill, attitude, and passion, so you can expose the incremental differences that separate the pretenders from the genuine high performers. 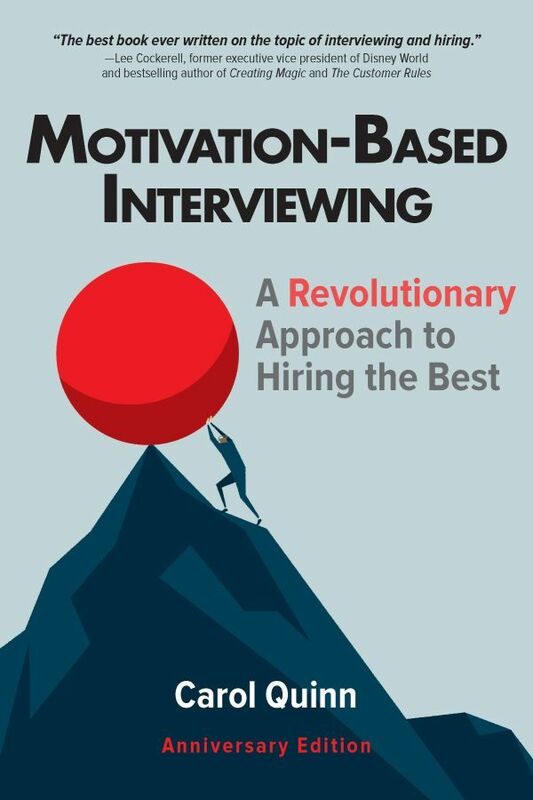 Once you discover the power of Motivation-Based Interviewing you’ll never conduct an interview any other way! Carol Quinn is CEO of Hire Authority and a national speaker with more than 30 years’ experience in interviewing and hiring. She has taught thousands how to hire High Performers using motivation-based interviewing.